If the entire front of the tooth needs to either be repaired or cosmetically improved, one option is a porcelain veneer. A veneer, by definition, is an overlay with a thin layer of a fine or decorative material. 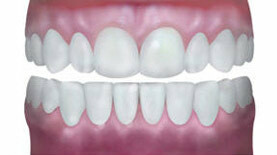 We can change the color, shape, length, alignment and spacing of your teeth with porcelain veneers. Veneers typically require two appointments; the first visit is needed to prepare the teeth by removing a small amount of tooth structure from the front surface of the affected teeth and then an impression is taken so a model can be made. The amount of tooth structure that needs to be removed depends upon several factors such as the alignment, length, shape, spacing, and any discolorations in your natural teeth. Your teeth might be temporized depending upon your case. The case is sent to the lab, and at the second visit the veneers are tried in, cemented, and adjusted to fit your looks, style, and personality. 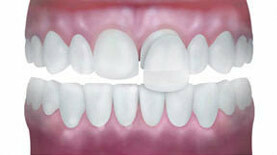 We can achieve a natural look with porcelain veneers because they are thin and there is no metal to be concealed. If and when your gums recede in the future, you will not have a dark gray line as was common with older porcelain crowns. We did our job well if no one notices our treatment. 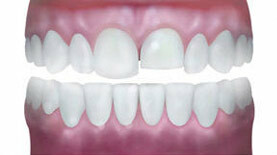 Please see our Veneers Gallery to see the types of results we can achieve with porcelain veneers.